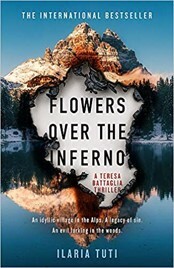 Set in a vividly realised location high in the Italian Alps, the first in a trilogy featuring Detective Superintendent Teresa Battaglia, of the Italian Police is simultaneously exciting and creepy, but most crucially - unputdownable. Teresa is a most unusual protagonist. She is a stocky, sixtyish woman with a bad temper. She is first seen through the eyes of Massimo Marini, a handsome young police recruit. He arrives at the scene of a horrible murder, covered with mud and much worse. Teresa is extremely rude to him, but fortunately he quickly picks up the respect with which she is regarded by her colleagues. From the horrendous details of the murder, Teresa is sure in her own mind that this is going to be the first in a string of serial killings. She presumes that the perpetrator is suffering from extreme psychosis, an area she has extensive expertise in. Marini gradually comes to know Teresa and her team while working alongside them on this troubling case. It is not long before Teresa's predictions are proved correct as other similarly horrific murders soon follow. As the novel progresses, there are numerous flashbacks dealing with the experiences of damaged people returning from previous traumas to this alpine area, dating right back to the aftermath of the Second World War. All the experiences are terrifying, and the inhabitants of the region are strangely secretive and uncooperative. Teresa knows that the only way of cracking this case is to persuade one of the long-term residents to talk about the past. But this initially seems impossible. What Marini doesn't know is that Teresa is battling her own demons. The novel is so absorbing that it would be a pity to reveal more, apart from informing of my eager and impatient anticipation of the second volume of this trilogy.